Abstract: Sugar, a 22 yr. old quarter horse mare, was treated three times for neck and back pain and decreased cervical range of motion. Treatments included acupuncture, electroacupuncture, and laser therapy. A satisfied client, an improvement in range of motion and a decrease in pain in the neck and back were the outcome of the acupuncture sessions. History and Presentation: Sugar is a 22 yr. old quarter horse mare used for trail riding. In May of 2017, she was seen by her regular veterinarian for foot pain and diagnosed with navicular disease. She was shod with a wedged egg bar shoe and treated with Osphos®. The mare did not appear to improve and was seen by a different veterinarian on March 30, 2018 for a second opinion. During her exam in March, the mare appeared to have no pain, heat, inflammation or reduced range of motion in either front foot. Her digital pulses were within normal limits (WNL). She tested positive to hoof testers across the heels and frogs. The mare was found to be grade 2/5 lame on the left front foot (LF) initially. When the LF hoof was blocked, the mare showed a grade 3/5 lameness in the right front (RF) hoof. A palmar digital nerve block of the RF improved the mare’s soundness by ninety percent. Radiographs taken during that visit revealed irregularities in the navicular bone and mild age-related changes to the coffin and pastern joints. A broken back hoof-pastern axis was also noted. The veterinarian observed that the mare appeared to be guarded in the shoulders and neck with pain evident around C3 and the point of the shoulder. The exact cause of foot pain was not pinpointed, but was described as a bilateral lameness affecting navicular bone, coffin joint, and pastern joint and involving the corresponding soft tissue structures. Treatment included bilateral injection of the coffin joints with hyaluronic acid and triamcinolone 1%. The owner was instructed to rest Sugar for 3 days and turn her out for 10 days. The mare received 2g of phenylbutazone once daily for 7 days and 1g once daily for an additional 7 days. Sugar was started on Cortiflex with MSM® for its chondroprotective and anti-inflammatory properties. Physical Examination and Clinical Assessments: Upon initial presentation, Sugar was quiet, alert and responsive. Her vitals were within normal limits (WNL) and, according to the owner, her gait had improved substantially. She was not on any anti-inflammatory medication and was still on the chondroprotective supplement and was being ridden lightly. Sugar’s feet had been trimmed, her angles corrected and she was shod in the front. The physical exam on 5/21/18 was unremarkable and Sugar’s vitals were WNL. An oral exam revealed sharp points and hooks along the buccal surface of the upper premolars and molars and occasional points on the lingual surface of the lower premolars and molars. Palpation of her submandibular lymph nodes, and thoracic/ abdominal auscultation were WNL. Visual inspection of her conformation and muscle mass revealed no asymmetries. No lameness was observed at a walk or trot. After her physical, a myofascial exam was conducted. Balance on all four limbs was WNL. Palpation of her temporalis muscles was uneventful, but palpation of both temporomandibular joints and masseter muscles elicited a pain response noted by an upward jerking of the head and an attempt to step away. “Yes/no” flexion was moderately restricted. Neck flexion to the right was more restricted than to the left, particularly in the cranial 2/3 of the neck. Palpation of the myofascia revealed soreness and stiffness in the upper 2/3 of the neck, over her right lumbar area and left hip area. Lateral flexion (fishtails) were mildly restricted on the left and moderately restricted on the right. The sacral pinch was unremarkable. The lumbosacral and sacroiliac manipulation elicited a response on the right, but not on the left. Spinal rotation was WNL. Mobilization of the front limbs revealed moderate restriction of the fetlock joint of the LF. Flexions performed on the pastern joint, carpal joint and mobilization of the scapula cranially, dorsally and caudally were unremarkable on both limbs. The mare was unwilling to drop her head while either front limb was extended forward (gator). Inward and outward hind limb rotation on the left and right side were unremarkable. Vascular/Infectious: Equine protozoal myeloencephalopathy (EPM) or clostridial myositis. Neoplastic: Nerve sheath tumors or bone tumors. Degenerative: Osteoarthritis secondary to age-related changes. Traumatic: Symptoms reflecting trauma to head or neck such as flipping over backwards or crashing into a wall, pain over lumbar region secondary to an ill-fitting saddle. Neck and back pain secondary to front limb lameness. Endocrine/Metabolic: Pituitary pars intermedia dysfunction (PPID), insulin resistance (IR). Myofascia: Myositis secondary to autoimmune disease, trauma or infection. Definitive (or Putative) Diagnosis (or Diagnoses): Compensatory muscle pain and stiffness secondary to front limb lameness. Unfortunately, there are no radiographs to rule out whether degenerative changes in the cervical vertebrae may be playing a role in Sugar’s neck or back pain. EPM would likely present with loss of muscle mass and concurrent neurologic deficits. EPM is not common in New Mexico and could be ruled out based on absence of serum titers or (if present) a cerebrospinal fluid tap. Nerve sheath tumors or bone tumors would likely present with concurrent neurologic signs. Radiographs or MRI of the neck could rule them out. Intoxication with poisonous plants would present with more severe clinical signs such as muscle tremors, stiffness, and a stilted gait. Locoweed (Astragalus spp. ), sand sagebrush (Artemisia filifolia) and ergot course with changes in behavior, stumbling and incoordination. Prince’s Plume (Stanleya pinnata) can cause foot pain and lameness, but is generally unpalatable and ingested as a final resource in starving animals which is not the case with Sugar. Tall fescue (Festuca arundinacea) intoxication secondary to endophyte infection (Neotyphodium coenophialum) can cause swelling of the coronary bands and kyphosis in the early stages (Allison, 2016). The chronicity of Sugar’s condition and the radiographic hoof changes make intoxication unlikely. Cervical stenotic myelopathy is observed in young horses in the growing stages and presents with neurologic signs that may include an unsteady gait or tripping (Janes, 2015), neither of which are present in Sugar. Immune-mediated myositis can present in older quarter horses and can course with muscle pain and stiffness. However, this condition is not common and can be ruled out based on bloodwork and genetic testing (CVM-MSU, N.D.) There is no adrenocorticotropic hormone (ACTH) or insulin to rule out PPID or IR. However, the classical clinical signs such as loss of muscle mass, laminitis, poor shedding, abnormal fat deposits or obesity (Ireland, 2018) are not evident and make endocrine diseases an unlikely diagnosis. 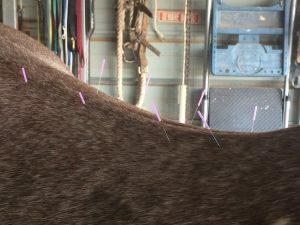 Medical Decision Making: The decision to treat the Sugar’s neck and dorsum was made based on the response to the myofascial exam and manipulation performed during each session. Regional areas of pain were reassessed and addressed in each visit. Sugar was treated three times combining acupuncture, electroacupuncture, and laser therapy. Acupuncture Treatments: Session #1 (5/21/18): Myofascial exam and mobilization revealed restricted pastern flexion of the LF. Right-sided hip pain was evident on the right pelvic rock and confirmed at the lateral flexion. Although both lateral flexions were restricted, the right was less flexible than the left. Most notoriously, Sugar had limited neck mobilization to the left and very limited neck mobilization to the right. The owner mentioned the mare had always been reluctant to have her head and neck manipulated. Fourteen (0.25 x 30 mm) coated Serin® needles were placed bilaterally in the following locations: BL 10, TH 16, SI 16, LI 17, LI 16, LI 15, LI 11. Nine (0.20 x 30 mm) were placed bilaterally at BL 13, BL 15, BL 20, BL 23 and Bai Hui (unpaired). Acupuncture needles stayed in place approximately 10 minutes with the exception of LI 11 on the left and BL 23 on the right (these points were very reactive and needles were pulled immediately). 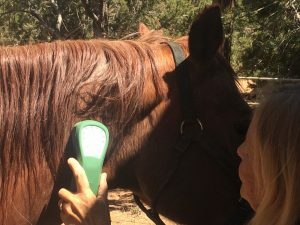 The session was completed with laser therapy using the Activet Laser® set at 1000 Hz (5 minutes around the neck on both sides and 5 minutes on the longissimus dorsi muscles on each side). Session#2 (5/28/18): Myofascial exam elicited a mild symmetrical response on both temporomandibular joints (TMJ), the cranial third of the neck and withers on both sides. Lateral neck mobilization was mildly restricted at the level of C3-C4 to the right and moderately restricted at the same level to the left. Lateral lumbosacral flexion and spinal rotation were uneventful, but myofascial palpation of her epaxial muscles elicited pain on left side. When this was observed, the owner mentioned she (the owner) was recovering from a leg injury on the right and may have weighted the horse more heavily on the left. Seventeen (0.30 x 30 mm) coated Serin® needles were placed bilaterally in the following locations: TH 16, SI 16, LI 18, a trigger point on the upper cranial of the neck along the cleidocervicalis muscles, SI 12, BL 15, BL 18, BL 23, and Bai Hui (unpaired). Acupuncture needles stayed in place approximately 10 minutes. BL 15 and 18 were connected to the Ito unit (channels 1 and 3) ipsilaterally for five minutes at 2.5 mHz The session was completed with laser therapy using the Activet Laser® set at 1000 Hz (5 minutes around the neck on both sides and 5 minutes on the dorsum on each side). Session#3 (6/17/18): Sugar’s teeth were floated prior to session #3 and no pain was present in the TMJ at the time of re-examination. Sugar felt remarkably pliable so points along her back and neck were addressed as maintenance. Eleven (0.25 x 30 mm) coated Serin® needles were placed bilaterally in the following locations: TH 16, BL 14, BL 16, BL 18, BL 19, and Bai Hui (unpaired). Acupuncture needles remained in place approximately 10 minutes. The session was completed with laser therapy using the Activet Laser® set at 1000 Hz (5 minutes around the neck on both sides and 5 minutes on the dorsum on each side). Outcomes, Discussions, and References: Sugar responded very well to therapy. After her initial treatment, the owner mentioned she was a bit quiet, but did not appear to be painful or need anti-inflammatories. Pastern flexion of the LF improved significantly by the second session, a response I was not anticipating. By her third treatment, Sugar allowed all manipulation of her head and neck and seemed very relaxed. She responded favorably to acupuncture and tolerated the laser despite the soft, high-pitched sound the unit emits. The owner was very pleased with her response to acupuncture, but was thrilled by the laser therapy and Sugar’s willingness to move her head with no hesitation. Allison, C., Turner, J. and Wenzel, J (2016). Poisonous Plants of New Mexico Rangelands. NMSU. CVM-MSU (N.D.) Immune-mediated myopathies. Retrieved from: https://cvm.msu.edu/research/faculty-research/valberg-laboratory/inflammatory-myopathies. Ireland, J. and McGowan, C. (2018). Epidemiology of pituitary pars intermedia dysfunction: A systematic literature review of clinical presentation, disease prevalence and risk factors. The Veterinary Journal. Retrieved from: https://doi.org/10.1016/j.tvjl.2018.03.002. Janes, J., Garrett, K., McQuerry, J., Waddell, S., Voor, M., Reed, S., Williams, N., MacLeod, J. (2015). Cervical Vertebral Lesions in Equine Stenotic Myelopathy. Veterinary Pathology. 52(5) 919-927. Retrieved from: sagepub.com/journals. DOI: 10.1177/0300985815593127.